One of the vehicles in President Yoweri Museveni’s convoy was on Monday stoned during chaos in Arua Municipality by-election campaigns. 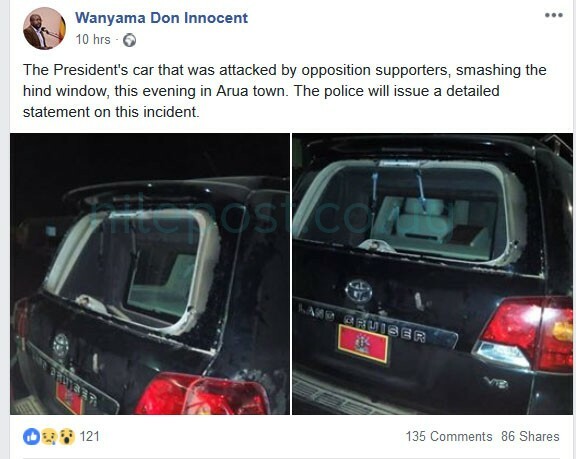 Pictures making rounds on social media showed the hind screen of the president’s car vandalised and shattered as chaos rocked Arua town on Monday evening. “President Museveni’s car that was hit by opposition supporters this evening in Arua town. The police will issue a statement on this incident shortly,” the senior presidential press secretary Don Wanyama posted on his twitter account. According to a statement about the incident, police spokesperson Emilian Kayima blamed it on the supporters Kassian Wadri whom he accused of targeting the president’s convoy while in Arua town. “There was a scuffle as Wadri’s supporters attacked the presidential motorcade as it left Arua Boma grounds where President Museveni had addressed Nusura Tiperu’s last rally,” Kayima said in what he termed as the situation report. The police mouthpiece said in an earlier incident, Wadri’s supporters had tried to block the presidential motorcade with a grader but were not successful in their mission. He however said that security forces intervened and fired bullets in the air to calm the situation. 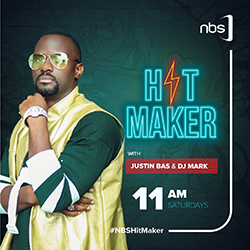 A number of people including MPs Robert Kyagulanyi also known as Bobi Wine and Francis Zaake Butebi were arrested. Kayima confirmed some people had been arrested to help police in investigations. Meanwhile, the Nile Post has independently found out that four journalists including Herbert Zziwa from NTV were arrested and spent the night in Arua police cells following the scuffle. A total of 34 people have so far been arrested in connection to last night’s events.